Have you been looking to get Richmond carpet installation from the best carpet company around? If so, you have come to the right place. 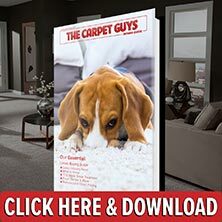 Here at The Carpet Guys, our Richmond carpet installers provide the absolute best services available. No need to spend any more time searching for a company to install your flooring, for you have found the best in the business. We are aware of how stressful it can be when you are in the process of buying new carpet. It can require a lot of time finding the perfect carpet company you know can be trusted. We believe that installing new carpet should be fun and exciting, not stressful. So how do we take a stressful process and turn it into an exciting one? It is all achieved by the amazing services we have to offer. We know how hectic the day can get, so we make free in-home estimates available every day of the week including the evenings. We offer the best carpet prices on high quality flooring products. Add the benefits of our carpet specials and you have got an unbeatable deal. Our carpet installers are the best in the business. They will provide you with the utmost respect and satisfaction. Rather than requiring you to take the time to drive out to a showroom, we will bring our showroom to your home. For every job we do, we offer a lifetime installation warranty. If any problems arise, we will fix it right away. Carpet costs have never been lower and we offer the best deals on carpeting. You will not find better pricing anywhere else. Whatever stresses you may face while buying new carpet is taken away. Whatever flooring needs you may have, we have got the means to take care of them. If you are ready to get new flooring installed in your home today, do not go anywhere else. The Carpet Guys are the ones for the job. Take a couple minutes to sit down and schedule a free in-home estimate via our website or call in to speak with our customer service representatives. Do not spend any more of your valuable time searching for carpet companies. Contact us today and take advantage of all the carpet sales we have to offer.